Beaducation: The Blog: Save up to 25% off Tools and Materials to Make One of our Most POPULAR Projects! Save up to 25% off Tools and Materials to Make One of our Most POPULAR Projects! 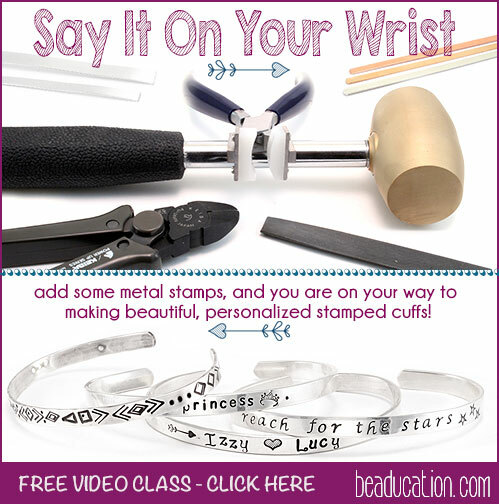 As our last hurrah for National Craft Month, we are offering 25% off select tools and materials needed to make one of my all-time favorite projects: Say It On Your Wrist. I first started teaching this class nationally about 12 years ago and it was an instant hit. At the time, there wasn't much metal stamping happening outside of the traditional American-Indian jewelry world. This project launched my love for (ok, obsession for) metal stamping. The greatest part about this project is it's transportability. With classic metalsmithing techniques, you would make this cuff with a jewelers saw, a very heavy (and expensive) steel bracelet mandrel, and a nylon mallet for shaping. With the tools you see above (along with stamps and a steel bench block), you can easily put this project in a bag and go. The heavy cutters take away the need to have a saw, and the bracelet bending pliers do the work of the heavy mandrel and nylon mallet. Don't forget, we have a free video class on how to make this project. With step-by-step video instruction and select tools and materials on sale, there is no reason to wait! Start making these awesome cuffs for all your friends now!